It’s been quite a while since I last posted to our blog, and I’ve decided going forward the blog posts will be more streamlined, because, time is valuable, and it’s more about the experience than the recap. My views on life changed a bit since our trip to Iceland back in October. With the passing of my mother in December, and realizing that all she wanted to do when she retired was travel more and use up that new passport she had received the year prior, I realized that we need to enjoy it while we can. Back to recap of beautiful Slovenia. Talk about a country that is not easy to get to. 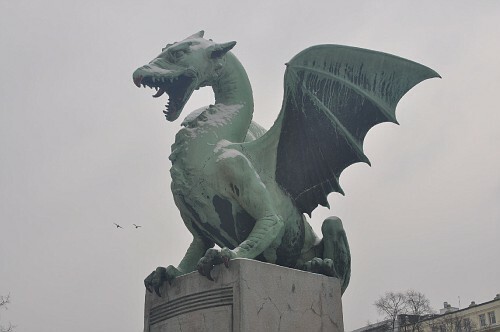 We actually flew into Zagreb, Croatia and drove over to Ljubljana since it was half the cost and the rental cars were cheap. We rolled into the capital mid-afternoon, checked into Hotel Cubo, which rocks, and put together our plan of attack. The first night we just wanted to relax a bit and get a good dinner, which we did a local hotspot which had some of the best bread I’ve ever tasted and some great local wine. Since we rented the car, we wanted to see as much as we could. We first headed down to the caves down in Postojnska. 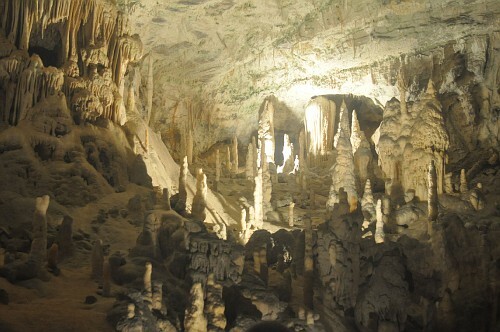 Slovenia is home to the second most caves in the world, and these were quite impressive. We took this child like mini-train into the caves, and then had about a 90 minute walking tour. They were quite impressive, and we are still amazed at how much work probably went into making these caves a tourist stop. Well worth the visit. 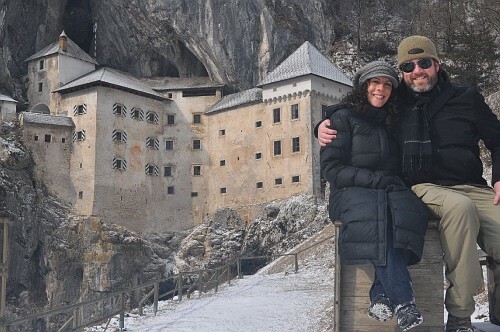 From there we headed down the road to see the Predjama Castle, which you have to see in person to be truly impressed. The whole castle is built into a wall of limestone, and is in amazing structural shape. We were the only people there, seeing it was offseason, but still enjoyable and hard to imagine that one family lived here at one point. Quite a unique castle...shocked that it had no water damage! After the castle, we headed up to Lake Bled, which is probably the most popular destination for anyone visiting Slovenia. It was snowing the whole day, so we weren’t sure what to expect driving up there, but we were in for quite a unique experience. There’s a famous church on an island in the middle of Lake Bled, that you normally would take a gondola type boat out to. Well on this day, and for the first time in 20 years, Lake Bled was frozen over, and to the point where it was thick enough to walk from the mainland out to the church…which was about a kilometer! Hundreds of people were ice skating, sliding across the ice and enjoying the rare day, which was freezing, obviously. Safe to say, we enjoyed our time on the ice, and walking the 99 steps up to the church…which was closed! We hit more monuments on the day when they are closed than anyone, I guess it’s our calling card. Once in a lifetime photo op? Probably not, but pretty cool. From there, we headed back to the hotel to relax and ultimately pass out for a bit. We decided just to get some room service, only to find out that there was no room service on the weekend for dinner, d’oh! We took our time the next day and walked about the city some more, but then drove over to Zagreb to spend the night before heading home. Zagreb was under a foot of snow when we got there, so wasn’t exactly the best time to be there, and we didn’t see much, so nothing to report there. « Iceland…nothing short of amazing! !